The Knight of Darkness wages final battles to the death with two of his greatest superfoes! First, The Shadow becomes "The Devil's Paymaster" to end the sadistic reign of The Prince of Evil in the violent conclusion of Theodore Tinsley's most acclaimed storyline. Then, Lamont Cranston must die if a superfiend's evil plots are to be crushed when "The Wasp Returns" in an action-packed thriller by Walter B. Gibson. 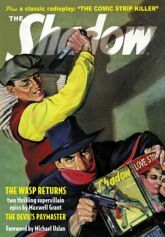 BONUS: The Shadow tracks down "The Comic Strip Killer" in a classic adventure from the Golden Age of Radio. This volume includes a Graves Gladney cover, original interior illustrations by Earl Mayan, and historical commentary by Will Murray and Anthony Tollin. Softcover. 7" x 10". 128 Pages. Black & White with Color Cover.